Free noontime concerts at Granite Mills Park in High Falls. The High Falls Business Association has once again teamed up with the Hochstein School of Music & Dance and WXXI to present Hochstein at High Falls, a noontime summer concert series. The series includes nine outdoor concerts Thursday afternoons at 12:15pm during June, July and August. Weather permitting, they will be held in the Granite Mills Park near the Pont de Rennes Bridge and will feature a diverse mix of musical artists and instructors. Attendees are encouraged to bring their own seating and lunch, or pick up a great lunch area restaurants﻿ (like La Luna, Caribbean Chateau, and Fina's Cafe﻿). Each performance runs approximately 30 minutes. WXXI-FM afternoon host Chris Van Hoff will introduce the featured musical talent each week. 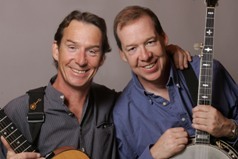 The June 16 concert features The Dady Brothers, who perform a wide range of musical styles. The versitle duo plays fiddle, mandolin, guitar, and many more. To hear one of their songs, click here. Hochstein at High Falls is on Facebook. Visit: facebook.com/hochsteinhighfalls. And for a complete list of concerts, and information about them, click here. Hochstein at High Falls is made possible with support from Ardent Learning Center, M5 Networks Inc., Entercom Communications, SEI Group, HUNT Engineers, Stantec, LaBella Associates, The Mills at High Falls, Norry Management Corporation, Phoenix Graphics, Roberts Communications, Partners + Napier, and Ward Greenberg law firm.